Corpse Flower just past bloom at the Chicago Botanic Garden. For the first time in many months (sometimes it feels like years), my family and I had a Lazy Sunday this week. We woke up whenever we wanted to. We had no commitments. We did not need to be someplace at a certain time. We decided to go to our local Botanic Garden and see the blooming Corpse flower. This has been a big event at our Botanic Garden in Chicago when these things bloom because they are very rare, very weird-looking and very smelly. Hence the name Corpse flower. Then we just walked around to see some of the Bulb garden which was filled with daffodils. We had a leisurely lunch. It was fantastic. 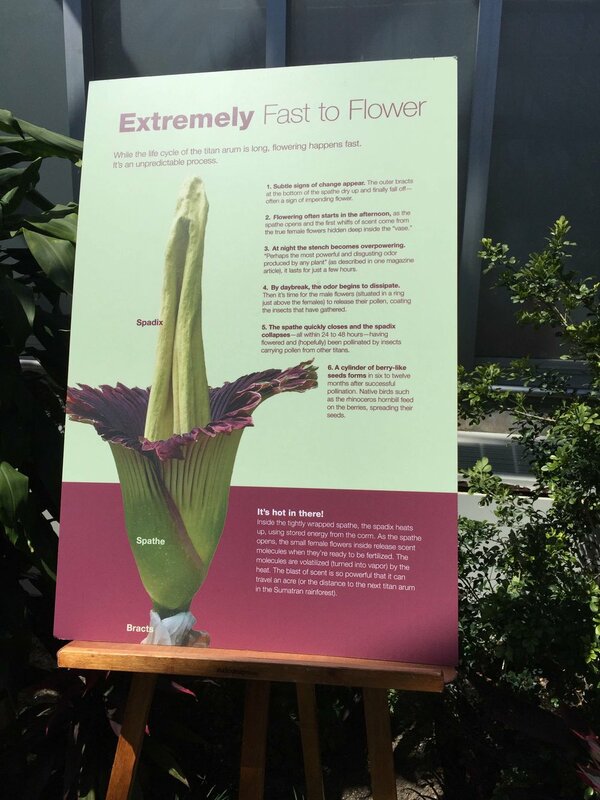 Information about the Corpse Flower blooming. My goal for years has been to have a day like this once a week, a Lazy Sunday. For families sometimes this is impossible especially if the children are in sports. Coaches do not care about rest and relaxation. Our culture does not seem to value relaxation anymore. I’m not quite sure why because I think it is one of the most important things you can do to boost your creativity. I feel like we are missing out on a day of being able to reset and approach the next week from a calm relaxed state of mind. Last week I shared my article Revisiting Very Relaxed and I have been thinking a lot about it. Someone told me this week that being relaxed is good when times are good but even more important in times of stress because you always make better decisions when you are relaxed. Fear and stress are never good companions when you are making decisions. So going forward I am going to incorporate Lazy Sundays into my list of priorities for me and my family. Daffodils and green leaves. Grateful for the signs of Spring. This doesn’t mean you don’t do anything or sit around and watch tv. Being lazy means you do things because you want to do them. They’re fun and relaxing not because you’re crossing off an item on your to-do list. You may garden or paint or sew or share a meal with friends and family. You can do so many things on your Lazy Sunday but only because that’s exactly what you want to be doing.